Nothing says summer like having a barbecue on the deck, sharing good times with friends and family, and being surrounded by lush, green plants. One of the many ways we can enhance our outdoor living spaces is by growing plants in containers. And it’s a garden activity we can do all summer long. 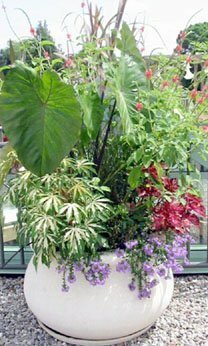 I think most home gardeners agonize over how to create a well balanced, colorful container. I think it’s just a question of knowing where to start. When I tackle an artistic feat such as this I always think about what’s inspiring me. Magazines are loaded with great ideas of plant combinations, but sometimes that’s not enough. I look at fashion, art, nature, even paint brochures for ideas on how I can interpret what I see into mastering a container design. This method is quite effective for me because I can be inspired by what I see everyday. Creating a successful container design is not all about color; texture plays a key role in great design as well. Try using plants of varying texture to help balance the overall effect so that there is something interesting to see at every angle. Understanding how colors compliment or oppose each other on a color wheel is also helpful. Nurturing your newly created container is just as important, if not more than, how good it looks. Let’s face it: it could be the best thing you ever created, but it won’t amount to much if you can’t keep it alive. 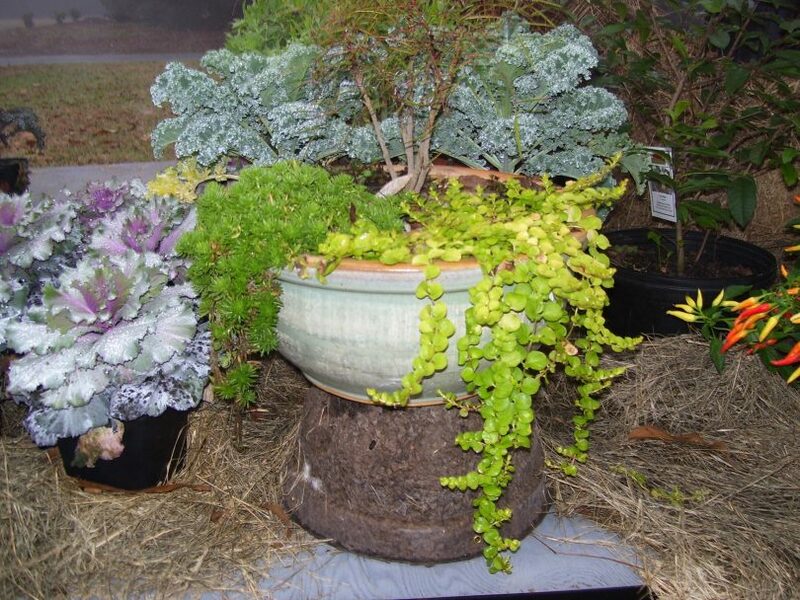 A container of mixed plants will dry out quickly if not watered regularly. And don’t rely on rain to satisfy it either (unless a monsoon comes to town). You may find you’re having to water it everyday depending on how well your soil holds moisture, and how well your plants tolerate any period of dryness. Watering may become a regular daily task, unless you can connect your container to a drip irrigation system. I have to admit, as adventurous as I am, I love plain old terracotta containers. Using them allows the plants to take center stage. They’re porous, lighter in weight, and often are available with simple designs to adorn their exteriors. But there are times when I want to really rev up the design by using not only bold plants, but a bold container to compliment. Glazed containers have been on the market for years, and the colors are simply amazing. 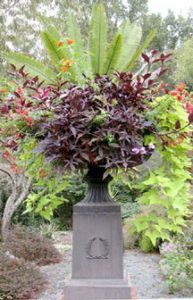 Just one brightly colored pot among many terracotta is a great way to dress up an area. 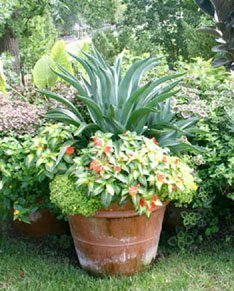 When deciding on which plants you’re going to choose, think carefully on how they will be used if you decide not to continue growing it in a container. I do this with small conifers and some perennials too. I keep several plants around for winter interest so I can seasonally change out my display from summer to winter. When winter is over I simply re-pot them in a random nursery pot to hold them through the summer so I can grow bolder and more dramatic tropicals and annuals such as bananas, cannas, agaves, and elephant ears. Containers are not just meant for the deck. Think of the most creative ways to display your container creations. Containers look great in a mixed bed, at the front door, or at the end of a garden path. Make it interesting and unexpected and help turn your garden into something completely different.